Apple desserts are a treat any time of the year. What can compare to the aroma of a homemade cinnamon-spiced apple crisp or pie? Apples are also versatile. You might try changing up the spices or adding a different flavor to your favorite apple cake or baked apples. Cinnamon, nutmeg, ginger, and cloves are classic spices to use in apple desserts. Some complementary flavorings include lemon, Calvados or apple brandy, brown sugar, vanilla, maple syrup or flavoring, and caramel. 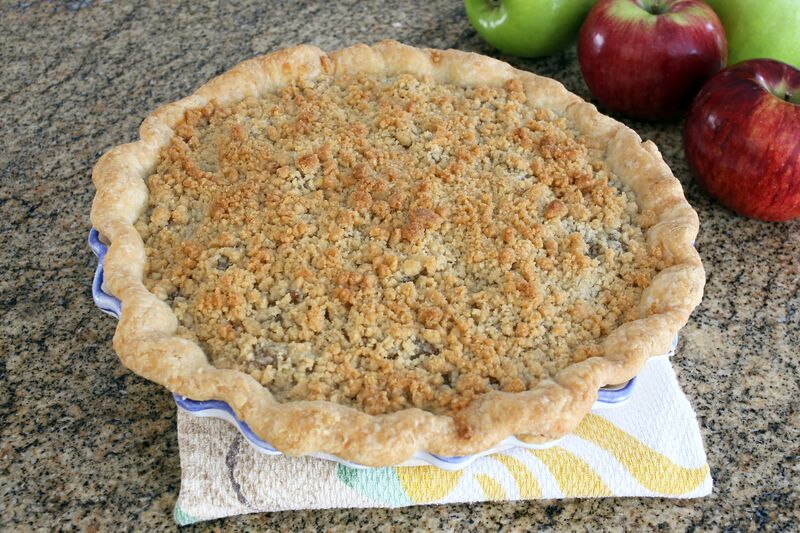 This irresistible cinnamon-spiced apple crumble pie features a simple brown sugar and pecan crumb topping, so you can make it quickly with a frozen pie shell if you like. If you aren't a fan of nuts, replace them with oats for an ​apple crisp pie. This amazing apple upside-down cake starts with a rich and buttery brown sugar and apple layer with a simple cake batter topping. Squares of puff pastry, sliced apples, and an easy glaze make these fancy looking mini apple tarts incredibly easy. Serve this incredible baked apple crumble dessert and be prepared to take a bow! With only 5 ingredients plus water and a dash of salt, it's the perfect dessert to make on a busy day. This moist apple cake with caramel icing is a delicious dessert that is sure to impress. Garnish the cake with chopped nuts or toasted coconut. These single-serve hand-held apple pies are made with buttery pastry and a chopped apple filling. Use the homemade butter pastry or two refrigerated pastry sheets. This cake is as moist and delicious as its name implies. A hot caramel topping is poured over the cake as soon as it comes out of the oven. This gooey caramel apple cake is baked in a square baking pan, making it an excellent size for most families. These old-fashioned apple cookies with raisins have a mouthwatering flavor and texture. Ice the cookies or sprinkle cinnamon sugar over them. Fresh apples and cranberries get together in this wonderful, subtly spiced cake. Drizzle this fresh apple cranberry cake with the easy caramel sauce or top it with a cream cheese ​frosting. This classic apple cobbler is amazing served warm with ice cream, or drizzle some sweet cream over it just before serving. Canned apple pie filling and whole berry cranberry sauce make this easy apple cranberry pie super easy to prepare. The brown sugar syrup makes this cinnamon-spiced baked apple pudding cake gooey and delicious. Cinnamon bread and Granny Smith apples team up in this yummy apple cinnamon bread pudding. Add some dried cranberries or raisins, if you'd like. Granny Smith apples and Golden Delicious apples make the perfect balance of sweet and tart in this apple pie with cream cheese pastry. These spiced apple fritters can be rolled in cinnamon sugar or dusted with powdered sugar. Drizzle some syrup over them and enjoy them as a dessert or breakfast fritter. Purchased or homemade apple butter adds flavor to these apple butter cupcakes with fluffy cream cheese frosting. This moist applesauce cake is filled with raisins and chopped walnuts. The cream cheese frosting is the perfect finishing touch.